Create a lighting portrait for your home by using light as the brush and your home as he canvas to create your nighttime masterpiece. Lighting designs create a balance between the interior and the exterior of your home while increasing living space. Divine Lightscapes is committed to providing our clients with the highest level of customer satisfaction. Our lighting design artist will utilize their extensive training and expertise to create a visual composition which best suits your unique requirements. 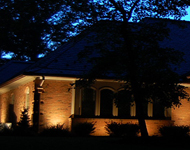 Landscape lighting is the primary deterrent to crime. Although lighting cannot prevent crime, statistics show that a well lit home or business is much more likely to deter potential criminals. 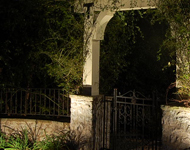 Outdoor lighting will help you to navigate safely around your property. Don't take our word for it, check out our reviews on Angie's List for yourself! We pride ourselves in being a family owned and operated business dedicated to making each and every customer so happy with our work that they'll tell someone else about us. Divine Lightscapes can create a lighting portrait for your home by using light as the brush and your home as the canvas to create your nighttime masterpiece. Lighting designs create a balance between the interior and the exterior of your home, increasing living space. We can also provide an inviting atmosphere by creating an outdoor resort-like environment for entertaining. Not only can Divine Lightscapes increase the nighttime curb appeal of your home but it also provides an excellent source of safety and security to protect loved ones. 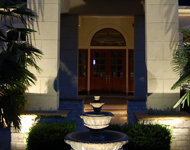 Divine Lightscapes is committed to providing our clients with the highest level of customer satisfaction. Our lighting design artist will utilize their extensive training and expertise to create a visual composition which best suits your needs. Call Divine Lightscapes at 704-749-4949 or contact us online. We have had many contractors work on our home but the best experience we have ever had was with Divine Lightscapes. They came out to our home set up lights for us to see, the affects they created were stunning. Tim was a pleasure to work with, would highly recommend.